WASHINGTON, DC, April 13, 2010 (ENS) – “Nuclear terrorism is one of the most challenging threats to international security, and strong nuclear security measures are the most effective means to prevent terrorists, criminals, or other unauthorized actors from acquiring nuclear materials,” said the leaders and ministers from 47 nations in their message tonight at the conclusion of the landmark Nuclear Security Summit. 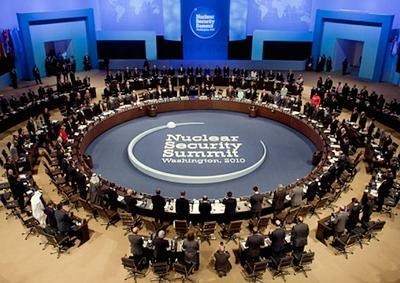 At the summit, 29 of the participating governments announced measures they have taken or are planning to strengthen nuclear security and reduce the threat of nuclear terrorism. Russian President Dimitry Medvedev announced that his government will shut down its last operating plutonium reactor. The ADE-2 reactor has been producing weapons-grade plutonium for nearly 52 years in the formerly secret Siberian city of Zheleznogorsk. In addition, Russia and the United States signed an agreement making nuclear arms reductions irreversible and reducing nuclear dangers. Russian Foreign Minister Sergei Lavrov and U.S. Secretary of State Hillary Clinton signed the document that updates the 10-year-old commitment of each country to dispose of no less than 34 metric tons of excess weapon-grade plutonium and envisions disposition of more weapons-grade plutonium over time. The initial combined amount, 68 metric tons, represents enough material for 17,000 nuclear weapons. Both countries aim to begin actual disposition by 2018, after the necessary facilities are completed and operating. “Much of the decommissioned warheads will be dismantled and their payloads will be converted into peaceful products,” Russian Deputy Foreign Minister Sergei Ryabkov told Ekho Moskvy radio on Monday, according to the official state news agency ITAR-Tass. “Plutonium will be disposed of and used at nuclear power plants. 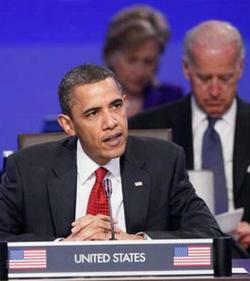 The Americans are doing the same,” Ryabkov said. Russia will spend the equivalent of US$2.5 billion on the program while the United States will invest $400 million. “In short, it is increasingly clear that the danger of nuclear terrorism is one of the greatest threats to global security, to our collective security,” said Obama. At the summit, Mexico, the United States, and Canada reached agreement to work together, and with the International Atomic Energy Agency, to convert the fuel in Mexico’s research reactor. At the summit, UN Secretary-General Ban Ki-moon today proposed a series of high-level conferences to continue global efforts to prevent terrorists from getting their hands on nuclear materials. Although the International Convention for the Suppression of Acts of Nuclear Terrorism was adopted by the General Assembly five years ago to the day, he said, only 65 countries, barely a third of UN Member States, have ratified it, he told the summit participants. “This is far from satisfactory,” said Ban. Ban underscored the need for accurate accounting and transparency of all stockpiles of fissile materials and for a reliable international treaty to keep their production in check. “Without a verifiable and legally binding fissile material treaty, other efforts will amount to only half-measures,” he said. Ban has repeatedly urged the Geneva-based Conference on Disarmament to immediately start negotiations on a treaty banning the production of fissile material for nuclear weapons or other nuclear explosive devices. “To spur this process along, I will consider convening a meeting of the Conference on Disarmament at the ministerial level during this year’s General Assembly session in September,” Ban offered. Ban also proposed strengthening the role of the UN International Atomic Energy Agency, noting that today’s summit communique called for enhanced engagement with the nuclear industry. Kazakhstan: Converting a highly enriched uranium research reactor and eliminating remaining highly enriched uranium; cooperative work on BN-350 rector shutdown and fuel security; hosting a Global Initiative Activity in June; considering a International Nuclear Security Training Center. United Arab Emirates: Signed a Megaports Agreement with the U.S.